MUSIC PLAY STUDIOS, founded by Lisa Orinn in 1995, is on a mission to enrich the lives of children and their families through the joy of music. In a happy and playful environment, children explore the wonders of music making with their family, friends and caregivers. Families start with our fun-filled core program, Music Together®, the internationally renowned music program for children Newborn to 7 yrs. This award winning program is a stand out among its peers because of it’’s cutting edge research and specialized teacher training. 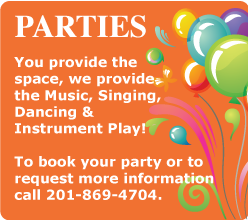 Music Play Studios also offers the Music Together “In-School” program to Pre-Schools and Day Care Centers, where they lead weekly music class and mentor classroom teachers on how to bring music and movement into the classroom. This curriculum supports the work of classroom teachers and engages parents, in addition to supporting each child’s music and overall development. Our wonderful teachers are all professional music educators, who love working with children and have a wide variety of both teaching and performing credits. If you have any questions about our programs, please call us at 201-869-4704. We can’t wait to start making music with you!